Residents have been moved further away from the crippled Fukushima nuclear plant in northern Japan as the no-go zone is extended and there is a new setback at the plant. Residents of the towns of Kawamata and Iitate were sent to evacuation centres. Attempts to stabilise one of the plant's stricken reactors have had to be halted amid fears that highly radioactive water is leaking. The power plant was badly damaged by the earthquake and tsunami on 11 March. More than 80,000 local residents living within a 20km (12 mile) radius of the plant have been evacuated from their homes. A "stay indoors" policy has been operating in the area 20-30km from the plant. A wider evacuation zone was decided upon last month as radiation levels were expected to increase, making the move necessary. 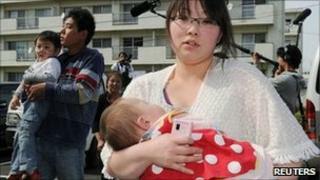 The towns are more than 30km (19 miles) from the Fukushima plant, which is continuing to leak radioactive material. About 5,000 people have been moved into public housing, hotels and other facilities in nearby cities. Theses first evacuees were reported to be mainly those with small children and pregnant women, who are thought to be more vulnerable. The Mayor of Kawamata, Michio Furukawa, told the first group of evacuees: ''I know you are worried but we will overcome difficulties together." More evacuations are expected in the coming days. Efforts to control the collapse of Fukushima are continuing to face problems. The plant's operator, Tokyo Electric Power Company (Tepco), had intended to cool reactor 1 by filling the containment chamber with water. But Tepco has now discovered that melting fuel rods have created a hole in the chamber, allowing 3,000 tonnes - more than could fit inside an Olympic-sized swimming pool - of contaminated water to leak into the basement of the reactor building. Some experts fear the water could pose a serious environmental hazard to groundwater and the Pacific. Tepco says it will come up with a new plan to stabilise the reactor by Tuesday. Such a scheme is likely to involve capturing the water and storing or processing it. Amid similar fears of a water leak at reactor 3, Tepco said it would transferring highly radioactive water from that reactor to a waste-disposing facility on Tuesday, reported Kyodo News. A giant water-storage barge - a Megafloat - has been dispatched to Fukushima as a possible storage site for contaminated water, and is set to arrive at the end of the month. The earthquake and tsunami knocked out cooling systems to the reactors, fuel rods overheated, and attempts to release pressure in the chambers led to explosions in some of the buildings housing the reactors. The government and Tepco have said it would take until next January to achieve a cold shut-down at the plant. Last week the government agreed a huge compensation package for those affected by the disaster. Analysts say the final bill for compensation could top $100bn (£61bn). In a separate development, the operators of Japan's ageing Hamaoka nuclear plant south-west of Tokyo said all reactors were in a state of cold shutdown. The plant is located in the Tokai region near a tectonic faultline just 200km from Tokyo, and Prime Minister Naoto Kan called for its closure in light of the catastrophic events at the Fukushima plant.